Slow and Steady Wins the Race went live action last September, putting to motion on video and street, our collection of continuous classics. Every Friday for the next few weeks, we will highlight the amazing cast featured in OUT/LAST. 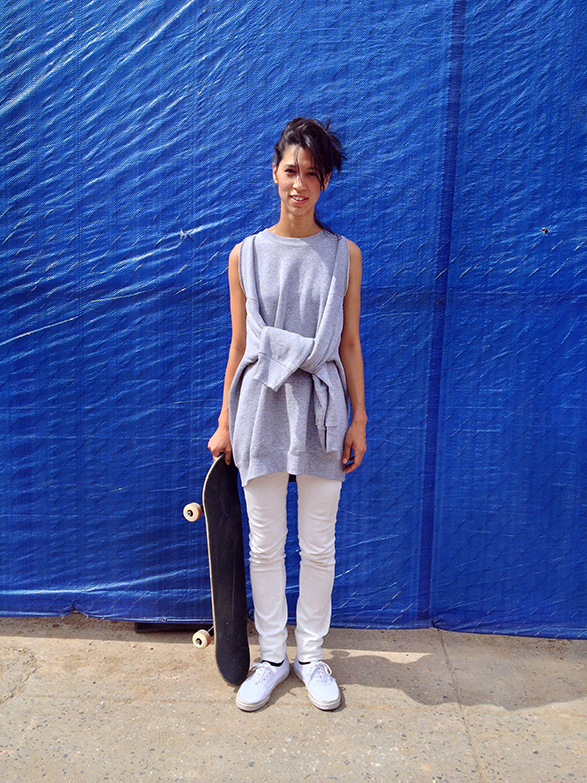 Manuela wears Detached Sleeve Sweats by Slow and Steady Wins the Race. Shoes Courtesy of Vans. Photo by James Kendi. SSWTR: What was the first skateboard you ever owned? MK: Can’t really remember, all i remember it was light green and white, and a Brazilian brand , given to me from an old friend named Guilherme. Haven’t seen or spoken to him ever since I moved to Japan. SSWTR: How does skateboarding influence what you wear? MK: I would call myself a very tomboy type of girl and since I started skating I would always choose the most comfortable clothes….. From the baggy “gangster” 90’s pants till really baggy tees printed with some lead singer photo or from whatever big skateboard Brazilian brand like URGH! till the really “chill” puffy high top adidas kinda shoes…. I guess I’m still into comfortability above all…. Just not so much into the “baggy puffy” direction…. SSWTR: What is your earliest fashion memory? MK: Like what? My first dreadlocks? SSWTR: If you could pick three people, dead or alive, to hang out with for a day, who would they be and what would you do together? MK: Cesar Millan aka “the dog whisper” – I would play with all his dogs. Elissa Steamer – I heard she’s into surfing a lot lately, so I would love to go surfing with her. Tia Torres – go on a pitbull rescue!! SSWTR: What was your favorite moment while shooting the video? MK: When we all went over the bridge.The downhill part was pure adrenaline.